We made these bite sized hearts the other day. We like to call it double the fun from two layers of chocolates – colorful candy melts and dark chocolate. Sweet and bitter taste of these two chocolates makes the sweetness of these bites just right. They are so easy to make and so delicious. 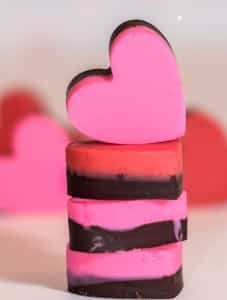 Perfect Valentine’s Recipe to make with kids. 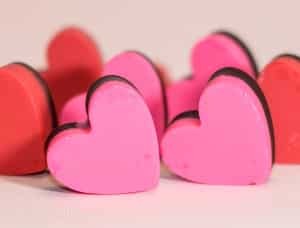 You can use your favorite colors to make these hearts. We had some leftover red and pink candy melts from M&M White Chocolate Cracker Bark and wanted to make something simple yet colorful. I also had some dark chocolate chips handy, as a result these Double The Fun Valentine Hearts were born.